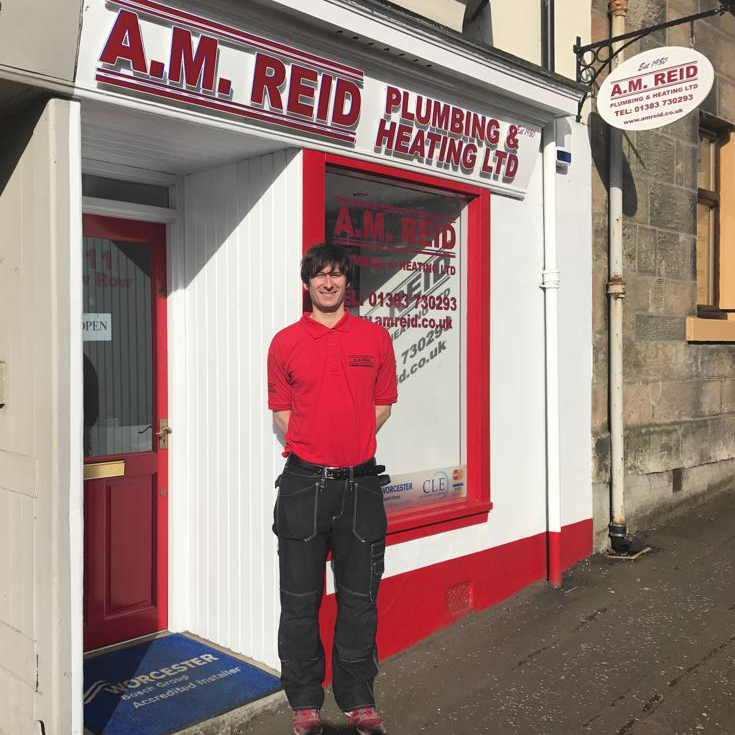 At A.M. Reid we have a wealth of experience amongst our team of qualified plumbing, gas and heating engineers working to give the best service possible. Jordan joined the company in January 1997 and completed his apprenticeship through A.M.Reid. Jordan became a Director of the company in 2009 and takes pride in the company name and strives to maintain A.M.Reid's values. He is fully qualified in all aspects of Plumbing, Heating and Leadwork. Matty joined the company in 2002. He is time served and completed his apprenticeship through A.M.Reid. Matty is popular with customers and became a Director of the company in 2016. Matty is fully qualified in all aspects of Plumbing, Heating and Leadwork. Aaron joined the company in 2005 and served his apprenticeship with A.M.Reid. Aaron has good all round knowledge and is a popular character. Aaron is fully qualified in all aspects of Plumbing, Heating and Leadwork. Aaron also specialises in boiler servicing and breakdowns. Derek joined the company in 1986. Between 1992 - 2015 Derek was a Director of A.M. Reid. Derek still remains an integral part of the team and deals with the majority of our plumbing maintenance work. Derek is time served and is fully qualified in all aspects of Plumbing and Heating. Stuart joined our team in August 2012 already as a time served plumbing and heating engineer, with a vast amount of experience. Stuart learned his trade in Edinburgh before moving across to the Dunfermline area. Stuart specialises in all Bathroom installations. 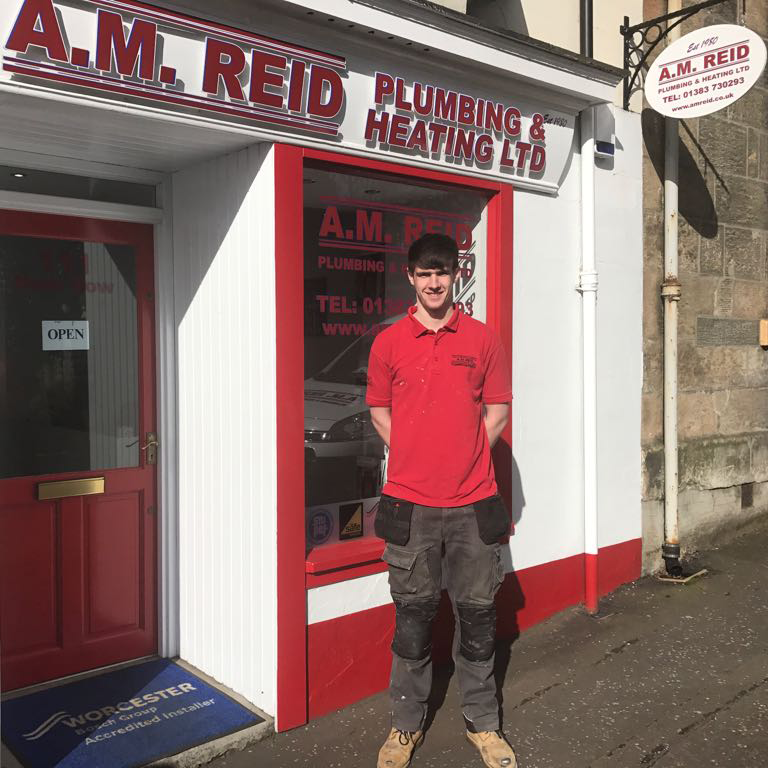 Steven completed his apprenticeship with A.M.Reid in 2015. He has developed into a dependable member of the team. Steven is fully qualified in all aspects of Plumbing and Heating. Chris is in his second spell with the company after starting back in August 2014. Chris brings a wealth of experience to A.M.Reid. Chris is fully qualified in all aspects of Plumbing and Heating. Stuart joined the company in 2016. After completing a university degree he decided to serve a Plumbing and Heating apprenticeship which he completed in 2014. Stuart is now qualified in all aspects of Plumbing & Heating and he has proved that he is very thorough. Cameron began his four year apprenticeship in May 2016, appearing keen,hard working and with a great maturity he is more than willing to learn the trade. Calvin joined our team and started his four year apprenticeship September 2017. Calvin is following in his dads footsteps learning the plumbing trade and seems determined to develop and achieve the skills required to complete his apprenticeship. Lewis is our newest addition to our team and started his four year apprenticeship in August 2018. Lewis impressed well recently during a trial period which bodes well for his future. Mary has been with the company since 1992. Mary is the first point of contact for A.M. Reid and works behind the scenes dealing with all administrative aspects within our busy office.